I find fried buns much easier to make and cook then the steam type. Here I am again making another batch fried buns, this time with chicken. Can also make this as flat buns, same as the beef buns posted earlier. to make the bread dough, mix dry ingredients together, then add in oil and gradually add in the water till you get a soft dough. Mix well and knead (machine or by hand) for about 5 minutes. Leave to rise for about 1 hour till double in size. While the dough is rising, mix the chicken filling together. When the dough has double in size, tip onto a floured surface and give it a quick knead by folding. Then leave to relax for few minutes and stretch the dough to a rod shape and cut into 12 – 13 equal pieces. Then shape each piece of dough into a ball. With hand dusted with flour, stretch the dough ball into a disc about 8cm round then put on a lump of filling. Gather the edge together, keep going round till you have sealed the bun. Give it a final pinch to seal. See slide show. Coat the bottom of the bun with flour then place on a tray to rise for about 20 minutes. In a large frying pan with lid, heat on (medium low heat) and brush a little oil evenly. Carefully lift up the buns with a spatula and place onto the heated pan, cover and cook for about 1 – 2 minutes (lift one buns up, check if it is light golden) if yes, drizzle about 4 tbsp of water around the buns, the pan will sizzle, lid on and let it steam fried. Check about after 2 minutes, if all the water has evaporated, add another tbsp or two of water and continue steam frying. After about 6 minutes steam frying the buns should be ready, all the moisture should disappear. The bottom of the buns will brown and crispy. If they are burnt the heat was too strong. 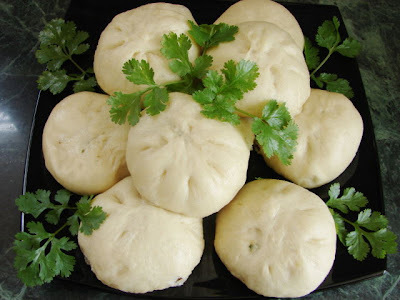 If there are buns left over, can keep in fridge, can be reheated using the same method by steam frying. could I use something else as a substitute? I would use about 2 - 3 tsp of brandy. Brandy goes really well with chicken. If not just leave it out.